I am so grateful this week to be on vacation. Hubs and I are having a wonderful beautiful staycation. We wake up late (8:15 am because we are old now) and drink coffee and watch shows and snug our pups. This was a much needed time of rest for us. Even though I am relaxing (kind of) I am still thinking about ways to make my life more manageable when I do go back to work, because it will come all too soon. One of my absolute favorite recipe categories are sheet pan dinners. Man do I love this. First of all, they are usually SO simple. Most of the recipes have a few simple but delicious ingredients and require like little to no preparation. Score! Secondly since they are on a sheet pan, these recipes take far less time to cook than a traditional slow cooker or 9x13 pan. I am all about that. When I get home from work I want to eat like now. I don't have time to be fumbling around in the kitchen for three years to get something in my stomach...no way. Thirdly, they usually require one freaking dish. Oh honey I am SOLD. The less dishes the better. I am all about that business. So I figured, lets get a list of the best sheet pan recipes around to make your life a whole hell of a lot easier. In case you wanted to start Keto, I have a 14 day meal plan here for freeeee! Well this looks absolutely amazing. You won't be bored with this little gem. Jam packed with flavor and fresh veggies, this is an amazing summer dish. I love this sheet pan adaption for a classic Indian dish! Okay, so are you seriously telling me I can make the WHOLE dinner on one pan? I think I am in love. You can never ever go wrong with corn on the cob and BBQ chicken. 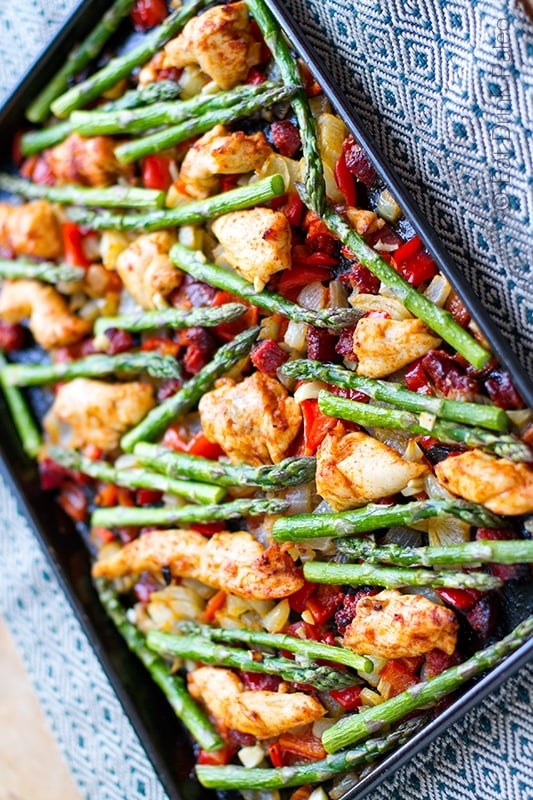 This sheet pan adaption of a timeless summer favorite. Hey all of you meat and potato lovers, this one is for you! My meat and potatoes kind of husband would be all about this recipe. The simple flavoring of the roasted potatoes with garlic allows the other veggies (onions and peppers) to take center stage and steal the show! This one looks so amazing it just might replace my Chinese food takeout habit. Again, using a thin cut of steak like a flank steak provides the perfect oppertunity for the speed and convenience of a sheet pan to be used here. Cooking up in less than 30 minutes there are no excuses to skip this one! This one is so so pretty. Whip up the super simple marinade the night before and let your chicken sit all day. When dinner time rolls around throw those babies on a pan with some tomatoes and you have healthy and flavor packed dinner in no time! You had better freaking believe it. Nachos. God bless the cheesy crunch of these heavenly things. A giant pan of nachos, a couple of beers and a good show (The Office, clearly) on Netflix and that is a perfect friday night. I love this recipe because it is so easily customizable. Making it vegetarian friendly is super simple. I prefer to load my nachos up with fresh veggies anyway! If you are worried about sheet pan meals being boring, you are going to be pleasantly surprised by this one! A quick and easy meal made with a few key ingredients will make your weeknight feel rather fancy. The garlic and herb butter used and this recipe makes me want to eat it for just about every meal. This recipe combines two of the best time saving hacks in the kitchen- meal prepping and sheet pan recipes. This is pure perfection. This recipe is so simple and delicious you will want to stay home and cook every single night of your whole life. Okay, not every night but like a lot of nights. Wait a hot second, did you say soup? Why yes, pretend audience I did say sheet pan soup! This recipe is amazing and colorful and healthy. The total package, eh? Roast up your tomatoes, red peppers and carrots on your sheet pan. Blend em up real quick and BAM there is a delicious soup coming your way! Were you mad at me because there weren't any pasta friendly dishes? I knew it. So here is one that is genius and so easy. The crispy and cheesy eggplant almost makes me feel like I am not eating a vegetable. This classic Italian dish will be sure to impress! The crunchy veggies and flavor packed meat make this dish irresistible. The cumin, paprika, and coriander give this dish a unique taste that will make you feel like you are in Madrid. Yum! Again, this sheet pan adaptation makes this dish so quick and easy, you just have to try it! I am SO excited about this find. I love meatloaf and mashed potatoes but sometimes the dishes and prep work discourage me from making it. This recipe cuts down the cook time and prep time making this comfort food available anytime! So that's it! The most unboring and attainable recipes you will see this week. And if you are like me and cringe each time you pull out your overly loved sheet pans, save yourself the trouble and grab a brand spanking new set here! Give them a try and then comment below! I want to see how these amazing sheet pan recipes work for you!